To get the maximum out of your TBS CROSSFIRE long range system ist important that you mount your antennas properly. They should be as exposed as possible. For long range flights it's required to use vertical orientation. For racing and short range also horizontal polarization can be used. Beside bad mounted antennas the biggest loss of signal you can get due cross polarized antennas. 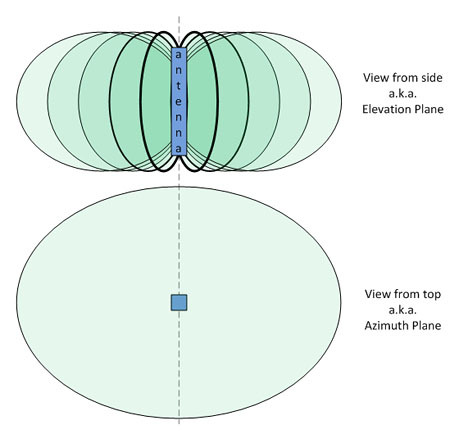 This means that your TX and RX antenna are 90 degree off to each other in terms of orientation. Cross polarization result in a higher loss of signal. This is why you should avoid mounting the antennas in a way they are cross polarized for leveled flight. Below is typical radiation pattern of a linear antenna. The part labeled with "antenna" is the active antenna element. It shows the highest radiation is 90° off the active antenna element and the weakest is on the antenna ends. The receiver antenna of the TBS CROSSFIRE Diversity Receiver should be placed in a V-Shape (90 degree to each other). This way one antenna stays vertical polarized even on high bank angles. For the Micro RX you have different options to place them. The best way is to mount them in a straight line. Therefore you can use some cable ties to guide them and fix the antenna with shrink tube. You can also mount them in a „L“ shape – with one vertical an the other part horizontal or you use the „V“ shape like on the diversity receiver. For best antenna orientation try to fit following requirements. It's important the active antenna element (red circle below) has as much clearance from any carbon or metal part as possible.